A few years ago, I was asked by the executive director of Wikimedia Foundation to “Save Wikipedia.” In the course of investigating why Wikipedia was declining, I discovered a fact that is not a secret, but it is also not discussed because it is too taboo to even speak of. 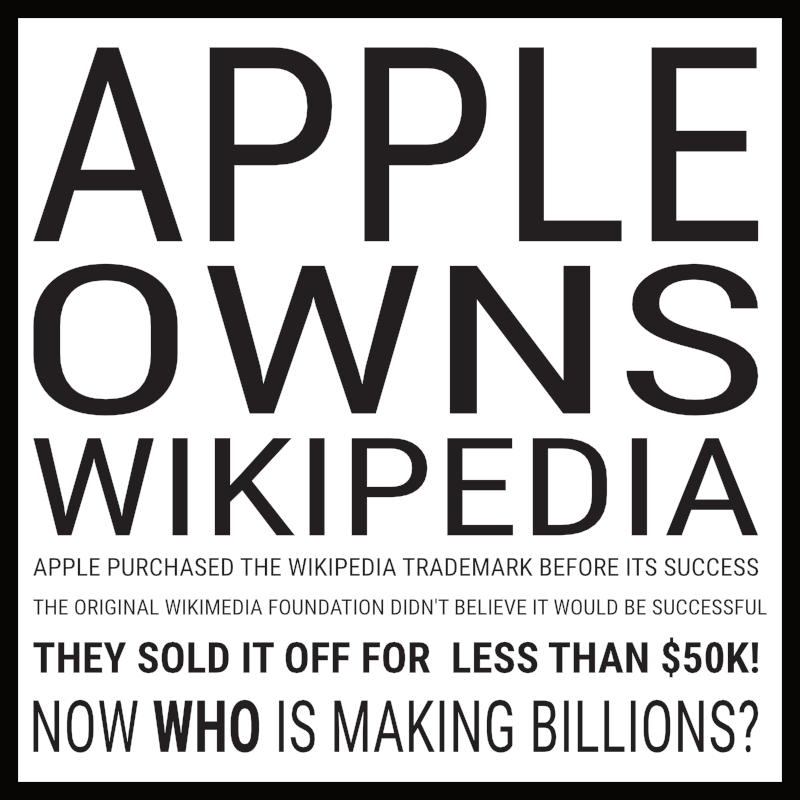 When Wikipedia was in its infancy, someone at WMF decided to sell the rights to the Wikipedia trademark to Apple. The agreement states that the contract cannot be cancelled without legal cause. And, it was for a few tens of thousands of dollars–a tiny fraction of what Wikipedia is worth today. Both organizations today use the image of Wikipedia without fear or recompense for the masses who create and curate Wikipedia. Today, Apple uses the Wikipedia logo ubiquitously and without threat in all parts of their operating systems. When you ask Siri a question, Apple will proudly display the fact that it retrieved your results from Wikipedia. There’s nothing but upside for them. They get to ride the coat-tail of trust that the World has for Wikipedia. After all, who would volunteer to build the worlds source of all knowledge for Apple? Why should we help make them rich? Turns out, Apple gets all that love. Will you feel proud when Grandma gives away a little of her last savings to Wikipedia because she believes in it? Don’t take my word for it. Ask them yourself. Ask WMF to see the agreement that was made. Ask what they’ve done to address the issue. Also, consider that all major search engines rely on Wikipedia for their search results already, and that they are making hundreds of billions from our efforts. The annual market for advertising on search engines was well over $80billion/yr just six years ago. How much have they made from Wikipedia since then?